Adiponectin is a hormone exclusively secreted by body fat. This hormone has been recently gaining attention from researchers because of some of its functions. Two important ones are the regulation of glucose and fat metabolism. Elevated levels of adiponectin are associated with increased insulin sensitivity, and increased fat catabolism (i.e., fat burning). And these associations appear to be causal. That is, adiponectin levels do not seem to be only markers, but causes of increased insulin sensitivity and fat catabolism. In other words, an increase in circulating adiponectin seems to lead to increased insulin sensitivity and increased fat catabolism. Insulin sensitivity is the opposite of insulin resistance. The latter is a precursor to diabetes type 2, and is associated with elevated fasting and postprandial (i.e., after a meal) glucose levels. Adiponectin also seems to work closely with leptin, another hormone implicated in a number of diseases of civilization. It appears that adiponecting and leptin modulate each other’s secretion and effects in metabolic processes. So what do we do to increase our levels of circulating adiponectin? Well, apparently there is only one guaranteed way, and that is to lose body fat! Adiponectin is unique among hormones secreted by body fat in that it increases as body fat decreases. Other important body fat hormones, such as leptin, decrease with body fat loss. The figure below (from: Poppitt et al., 2008) shows a graph where adiponectin levels are plotted against body mass index (BMI). BMI is strongly correlated with body fat percentage. As you can see from the figure above adiponectin levels more than double when BMI goes from 26 to 20. One does not need to be obese to take advantage of this effect, and to benefit from having increased adiponectin levels. - BMI is not a very precise measure of body fat. A very muscular person will have a high BMI and low body fat. That person will consequently have much higher adiponectin levels than an obese person with equal BMI. - Adiponectin levels are naturally higher in women than in men. This is another point in favor of adiponectin, as women have always been the evolutionary bottleneck among our Paleolithic ancestors. Now you know why doctors prescribe weight loss to patients with diabetes type 2. And, when we look at various hunter-gatherer groups that were apparently free of diseases of civilization prior to westernization, there are only a few common denominators. Diet was not one of them, as Weston Price and others have shown us, at least not in the sense of what they included in their diet. One of the few common denominators was arguably the fact that those hunter-gatherers typically had relatively low levels of body fat; an almost universal feature among non-westernized hunter-gatherers. Poppitt, S.D. et al. (2008). Postprandial response of adiponectin, interleukin-6, tumor necrosis factor-α, and C-reactive protein to a high-fat dietary load. Nutrition, 24(4), 322-329. - This post is a joke, admittedly a weird one, which is why it is labeled “humor” and is filed under “Abstract humor”. Today I was spending some time under the sun, in one of the year’s 364 sunny days in Laredo, Texas. The goal was to see if I could obtain a precise count of the number of advanced glycation endproducts (a.k.a. AGEs) that would form as my skin was exposed to the sun’s damaging rays. Then I read a post by Peter at Hyperlipid, and inspiration consumed me. A new theory was born regarding the interplay of LDL, chylomicrons, HDL, and atherosclerosis. By the way, Peter is a fat genius, by which I mean a genius regarding all fat issues – who happens to be thin. The endothelium gaps, which let atherogenic particles enter into the forbidden area and do their damage, are around 25 nanometers in diameter. And what is the typical size of LDL particles? You guessed it, 25 nanometers in diameter! And guess what more, quite a few of the chylomicrons, another group of particles that would elicit immediate revulsion in any normal human being, are even smaller than 25 nanometers in diameter; those atherogenic pests! So here is the theory, in a nutshell. A 500-page book will clearly be needed to discuss it in more detail. The Devil created LDL particles to kill us all. But LDL particles were not such effective killers, because the Devil, trying to pack as much killer cholesterol into them, ended up making them too big! At 25 nanometers in diameter, on average, they basically had to squeeze their way into the forbidden area. Since LDL particles were not doing a good enough job, the Devil also created chylomicrons, and those chaotic pests come in all sizes. In fact, it is well known that the word chylomicron has a Greek origin: chylo = killer, micron = particle (Deth & Disis, 1999; full reference at the end of this post). And, needless to say, LDL particles and chylomicrons are fat particles that make the blood kind of taste and smell like butter, a toxic substance often fed to laboratory rats and known for its powerful carcinogenic properties among all living creatures except descendants of Vlad the Impaler. The latter has long been rumored to have been one of the Devil's best buddies, so no surprise there. 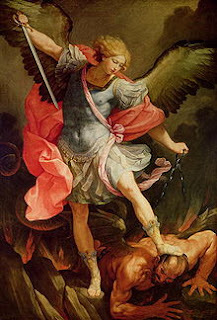 Michael the Archangel, who dislikes the Devil, and usually takes a hands-on approach to dealing with those he dislikes, the Devil in particular, gave us HDL particles. If you have any doubts about Michael’s hands-on approach, check the picture below (from: Wikipedia), which clearly shows what Michael had already done to the Devil. And that was over a relatively minor disagreement. And don’t think about trying to discredit this theory by asking why HDL particles are so small compared with LDL particles and chylomicrons! This is easy. For the same reason that David was small and Goliath big! But those nasty particles, the LDLs and chylomicrons, weren't only two big bullies, they were two against one. HDL particles were doing a valiant job at fighting the damage done by the Devil’s two evil particles, but not quite enough to save everybody from atherosclerosis. Michael cried foul, and threatened to give the Devil another lesson. God, seeing this, said: Michael, no, mankind must be given a choice! If men and women want to gorge on the fatty flesh of the beasts they savagely slaughter, let them sin and face the consequences. This theory probably needs some adjustments and refinements based on analysis of refereed research, especially solid research supported by drug manufacturers, and consultation with the most interesting man in the world. But I am pretty confident it can, after adjustments and refinements, pass the test of time. Deth, R., & Disis, M. (1999, Feb 31). The origins of killer lipids: An evolutionary-theological perspective. The Lipid Review, 123(7), 77-66. Every year I travel to Europe on business, normally once or twice a year. These trips usually involve meetings with engineers, researchers, and project managers from various European countries; often 5 to 10 countries are represented. Here are some of my notes on a recent trip to Europe. In this trip I spent time in two cities: Amsterdam, Netherlands and Antwerp, Belgium. Below is a set of the photos I took in Antwerp, of a statue depicting the roman soldier Silvius Brabo holding the severed hand of the giant Druon Antigoon. According to legend Druon Antigoon had terrorized and extorted the people of Antwerp, cutting off the hands of several people and throwing them in the nearby Scheldt River, until the brave Silvius Brabo came into the scene and not only cut off the giant’s hand but also killed him. This legend has probably been concocted toward the end of the Roman Empire, largely by the Romans, who first established Antwerp as a Roman outpost. After this small digression, here are some health-related routines that I followed during this trip, and some of my main observations regarding diet and health issues. - The meals were a festival of hyperglycemic and pro-inflammatory refined carbohydrates, unhealthy vegetable oils, and sugars – white bread, pasta, various sweets, pretzels, chips loaded with supposedly healthy omega 6 fats, margarine etc. I skipped all of the snacks and one of the meals, the breakfast. At the main meal of each flight I ate only meat, veggies, and some of the fruits. - The flights over and back were very comfortable since I was water-fasting most of the time. Not a hint of indigestion or abdominal discomfort of any kind. These were 9 to 10 hour flights, from Houston to Amsterdam and back. - The idea of having a sandwich for lunch seems to be getting popular in Europe. At least I have been seeing that happening more and more often lately. At these sandwich luncheons, I ate only the content of some sandwiches (basically cold cuts, cheese and veggies), and left the bread slices untouched. - Some people noticed that I was not eating bread. I told them about insulin, lectins etc. A few looked at me as though I was insane; others with a disapproving look – dontchano, the lipid hypothesis!? A notable exception was a German gentleman who said that Germans were too pragmatic not to notice that they were getting fat on low fat diets, and are now reverting back to their staple diet of meats, fish, vegetable stews, and cheese. - This was fairly easy. I ate basically fish or meat dishes with veggies, and enjoyed them a lot. I skipped the deserts; again much to the surprise of some of my European colleagues. - Skipping the desserts seems to have helped me cope with jetlag a lot better than I usually do. On my second day in Europe I slept quite well, and was unusually rested on the next day. - The breakfast buffets were a mix of: (a) breads, pastries, sweetened cereals, sugary items, and fruits; and (b) meats (often cured), some fish, cheeses, eggs, nuts, and some veggies. There were also fruit juices. I had solid breakfasts with (b)-type items, with a few fruits added (cantaloupe and berries). I had regular coffee with cream and no sugar, and stayed away from fruit juices. - I did not use soap, shampoo etc. at the hotel; just plain water. Occasionally the soap used in hotels is very caustic, or rich in other chemicals, causing rashes. I stuck with showers and had no baths, as sometimes the bathtubs are not properly cleaned after their last use. - At the end of my trip I took a train from Antwerp to Amsterdam, and stayed at a hotel near the Schiphol Airport (which has its own train station) since my flight back to the U.S. was in the morning. I had dinner by myself at the hotel, which was easy. I stopped at a place called Food Village at the Airport (visible from the Airport’s main entrance) and bought a water bottle, a piece of Gouda cheese, a can of sardines, and a box of seaweed. That was a very good dinner, and cost me about 6 euros. - I had no hint of indigestion at all throughout the trip, in spite of eating way more cheese than I normally do. The cheese that I ate was natural, aged cheese, not the processed kind. - I had no need for more or less use of the bathroom than I usually do, and remained “regular” throughout the trip. No sign of constipation at all. - I had no body odor (at least none that I could notice), even though I used no soap. My hair was fine too; I used no shampoo or conditioner. - Jet lag problems were less pronounced than they usually are when I travel to Europe. The time difference is about 7 hours from Texas. Usually, I tend to feel very sleepy in the afternoon and wide awake around 3 am. Not this time. - In spite of not exercising for about 7 days, except for walking, I was able to lift slightly heavier weights at a workout the day after my return than I did before my trip. - According to the scale, I lost 1 pound during this trip. I do not know whether this was body fat or just water. It is unlikely that there was any muscle loss. From what I could see, Europeans are generally thinner than Americans (particularly Texans), and also seem to be healthier. None of the people I met, not one, was clearly obese. On the other hand, the majority seemed to be somewhat overweight. My impression was that the Europeans consume lesser amounts of refined carbohydrates and sugars than Americans, on a weekly basis, even though they currently consume more of those items than they should, in my opinion. Consumption of vegetable oils other than olive oil is also lower than in the U.S; consumption of butter and cheese seems to be a lot higher. From my conversations with several people during this trip, it seemed that the health of Europeans, like that of their American counterparts, is strongly correlated with the extent to which they are overweight. The more body fat, the more common was to hear complaints about pain here or there, fatigue, degenerative diseases, or talk about surgeries. This is a follow up on this post, which addressed the main argument put forth in a recent BBC article. The BBC article argued that people should replace saturated with polyunsaturated fats to reduce their risk of heart disease. Let us take a look at the actual Harvard study itself (i.e., the study discussed in the BBC article). The Harvard study is linked here. This post, by Stephan Guyenet, already pointed out several problems with the study. Stephan actually reviewed the studies used in the meta-analysis, and also some that were excluded in the meta-analysis and that he believes should have been included. A meta-analysis is a study that essentially summarizes, in a statistically sophisticated way, a bunch of other studies (the “sourced” studies). Too much between-study heterogeneity (i.e., widely disparate results among sourced studies) is undesirable, because it can bias the results. The problem is similar to that of trying to summarize net worth figures (e.g., by calculating their average) in a middle class neighborhood that happens to have a few billionaires living in it. The heterogeneity in wealth may lead to a wildly overestimated average. Now, we know that p values go down with sample size, and are usually high with small samples unless the effect measured by the statistic is very strong, regardless of the statistic used. Well, with a sample of only 8 studies, their p value (associated with the Q statistic) is close to being significant at the 0.05 level! If this sample of sourced studies were a little higher (say, 20), there would be significant between-study heterogeneity, which would call the meta-analysis into question. This is a big problem, since a good meta-analysis is expected to include a large number of studies (e.g., greater than 100), and this one included only 8 studies. Moreover, to the best of my knowledge, the Q statistic is not very reliable when used with small samples, due to its low power as a test of heterogeneity. This makes the p value reported even more problematic. Finally, the sourced study with the largest sample (n = 9,057; thus possibly the most credible), indicated as “Minnesota CS” on Figure 2 of the Harvard study, found increased risk of heart disease associated with increased consumption of polyunsaturated fats and reduced consumption of saturated fats. Mozaffarian, D., Micha, R., & Wallace, S. (2010). Effects on Coronary Heart Disease of Increasing Polyunsaturated Fat in Place of Saturated Fat: A Systematic Review and Meta-Analysis of Randomized Controlled Trials. PLoS Med., 7(3): e1000252. doi: 10.1371/journal.pmed.1000252. The BBC article is here. It is based on meta-analysis of eight previous studies conducted by Harvard researchers, which the article states cover more than 13,000 people. The article also says that: “… [saturated] fats raise the levels of bad cholesterol that block the arteries to the heart.” They are of course referring to LDL cholesterol as the "bad cholesterol". Sourcing bias is a notorious problem with meta-analyses (i.e., the choice of studies to use in a meta-analysis). Another problem is that you cannot tell what the studies sourced controlled for. Consider a study that compares health markers for smokers and non-smokers, where the smokers eat more saturated fat than the non-smokers. This study may confuse the effect of smoking with that of saturated fat consumption. To be reliable, the study must analyze the effect of saturated fat consumption, controlling for smoking habits. There are other statistical issues to be considered in meta-analyses. For example, some of the sourced studies may take nonlinear relationships into consideration and others not. In multivariate analysis studies, nonlinearity may lead to significantly different results from those obtained through more conventional linear analyses. Finally, reaching misleading results with sound statistical analyses is not that hard. As my age went from 1 to 20 years, my weight was strongly correlated with the price of gasoline. Yet, neither my weight caused the price of gasoline, nor the other way around. When you look at an individual study, not a meta-analysis, you can at least try to identify the possible sources of bias and mistakes. - Increasing HDL cholesterol levels, especially beyond 60 mg/dl, dramatically decreases the risk of heart disease; and this is an almost universal effect in humans. This reduction in risk occurs even for people who suffer from diabetes and familial hypercholesterolemia. The latter is a genetic condition that is associated with very elevated LDL cholesterol and that is rare, typically afflicting 1 in 500 people in its heterozygous (and most common) form. - Increasing consumption of saturated fats (present in: lard, fatty meat, coconut oil) and dietary cholesterol (from: fish, organ meats, eggs), while decreasing consumption of refined carbohydrates (e.g., pasta, white bread) and sugars (e.g., table sugar, high fructose corn syrup), significantly increases HDL cholesterol for the vast majority of people. Neither omega-6 nor omega-3 polyunsaturated fats lead to the same results. Omega-3 fats do reduce triglycerides, and increase HDL somewhat, but their effect on HDL pales in comparison with that of saturated fats. Excessive consumption of omega-6 fats is associated with chronic inflammation and related health problems. - With the exception of cases involving familial hypercholesterolemia, there is no conclusive evidence that LDL cholesterol levels are associated with heart disease. Two widely used online calculators of risk of heart disease, based on the Framingham Heart Study and the Reynold Risk Score, do not even ask for LDL cholesterol levels to estimate risk. And that is not because they calculate LDL cholesterol based on other figures; they do not ask for VLDL cholesterol or triglycerides either. After reading the BBC article again, it is clear that they are re-stating, in general terms, Rudolph Virchow’s mid-1800s lipid hypothesis. And they do so as if it was big news! I guess PepsiCo is moving ahead of the competition, but in a snail pace and in a very, very politically correct way. Will this help in any way? I doubt. It is just too little, too late. See article here. The company also set two goals for the next 10 years: to cut the average added sugar per serving by 25 percent and saturated fat per serving by 15 percent, in addition to adding more whole grains, fruits, vegetables and low-fat dairy into its array of products. The company also set two goals for the next 5 years: to cut the average added sugar per serving by 95 percent and increase saturated fat per serving by 50 percent, in addition to adding more vegetables and full-fat dairy into its array of products. What would happen? Well, Indra Nooyi is a very smart CEO, and the company has many competent people. They know that they would probably lose enough customers to go out of business … or become the Apple of their industry. The bottom line is that, if you want to improve your health, you should generally avoid any food or liquid that is highly industrialized. Maybe PepsiCo should add unprocessed coconut water to their portfolio of drinks. Researchers can build mathematical equations (sometimes referred to as structural equations) that predict health outcomes based on health factors. Those mathematical equations can then be used in online calculators. This link takes you to a government-sponsored calculator based on the Framingham Heart Study. It estimates 10-year risk for “hard” coronary heart disease outcomes (myocardial infarction and coronary death). As you will notice, the link above does not take family history of disease into consideration. A different risk calculator, linked here, estimates a risk score called the Reynold Risk Score. It takes hsCRP (high sensitivity C-reactive protein, an inflammation marker) and family history in addition to the Framingham parameters in its risk score calculation. Neither calculator asks for LDL cholesterol levels. I wonder why. Often research results are expressed in means and standard deviations. For example, in the study reviewed in this post, it is stated that the weight of participants in a 12-week weight loss study varied from: 87.9 plus or minus 15.4 kg (at baseline, or before the 12-week intervention) to 81.7 plus or minus 16.2 kg (after the 12-week intervention). The 87.9 and 81.7 are the average weights (a.k.a. “mean” weights), in kilograms, before and after the 12-week intervention. However, the 15.4 and 16.2 are NOT the range of variation in weights around the means before and after 12-week intervention. They are actually the ranges around the means encompassing approximately 68 percent of all of the values measured (see figure below, from www.electrical-res.com). In the figure above, the minus and plus 15.4 and 16.2 values would be the “mean(x) – s” and “mean(x) + s” points on the horizontal axis of histograms of weights plotted before and after the 12-week intervention. This assumes that the distributions of weights are normal, or quasi-normal (i.e., similar to a bell-shaped, or normal, curve); a common assumption in this type of research. The larger the standard deviation, the wider is the variation in the measures, and the flatter is the associated histogram (the bell-shaped curve). This property has a number of interesting implications, some of which will be discussed in other posts. Sometimes another measure of dispersion, the variance, is reported instead of the standard deviation. The variance is the standard deviation squared. The reason why standard deviations are reported instead of ranges of variation is that outliers (unusually high or low values) can dramatically widen the ranges. The standard deviation coefficient is much less sensitive to outliers. This is a follow up on this post. Just to recap, an interesting hypothesis has been around for quite some time about a possible negative effect of ketosis. This hypothesis argues that ketosis leads to the production of an organic compound called methylglyoxal, which is believed to be a powerful agent in the formation of advanced glycation endproducts (AGEs). In vitro research, and research with animals (e.g., mice and cows), indeed suggests negative short-term effects of increased ketosis-induced methylglyoxal production. These studies typically deal with what appears to be severe ketosis, not the mild type induced in healthy people by very low carbohydrate diets. However, the bulk of methylglyoxal is produced via glycolysis, a multi-step metabolic process that uses sugar to produce the body’s main energy currency – adenosine triphosphate (ATP). Ketosis is a state whereby ketones are used as a source of energy instead of glucose. Thus it follows that ketosis is associated with reduced glycolysis and, consequently, reduced methylglyoxal production, since the bulk of this substance (i.e., methylglyoxal) is produced through glycolysis. So, how can one argue that ketosis is “a recipe for accelerated AGEing”? One guess is that ketosis is being confused with ketoacidosis, a pathological condition in which the level of circulating ketones can be as much as 40 to 80 times that found in ketosis. De Grey (2007) refers to “diabetic patients” when he talks about this possibility (i.e., the connection with accelerated AGEing), and ketoacidosis is an unfortunately common condition among those with uncontrolled diabetes. A gentle body massage is relaxing, and thus health-promoting. Add 40 times to the pressure, and the massage will become a form of physical torture; certainly unhealthy. That does not mean that a gentle body massage is unhealthy. Interestingly, ketoacidosis often happens together with hyperglycemia, so at least part of the damage associated with ketoacidosis is likely to be caused by high blood sugar levels. Ketosis, on the other hand, is not associated with hyperglycemia. Finally, if ketosis led to accelerated AGEing to the same extent as, or worse than, chronic hyperglycemia does, where is the long-term evidence? Since the late 1800s people have been experimenting with ketosis-inducing diets, and documenting the results. The Inuit and other groups have adopted ketosis-inducing diets for much longer, although evolution via selection might have played a role in these cases. No one seems to have lived to be 150 years of age, but where are the reports of conditions akin to those caused by chronic hyperglycemia among the many that went “banting” in a more strict way since the late 1800s? The arctic explorer Vilhjalmur Stefansson, who is reported to have lived much of his adult life in ketosis, died in 1962, in his early 80s. After reading about his life, few would disagree that he lived a rough life, with long periods without access to medical care. I doubt that Stefansson would have lived that long if he had suffered from untreated diabetes. Severe ketosis, to the point of large amounts of ketones being present in the urine, may not be a natural state in which our Paleolithic ancestors lived most of the time. In modern humans, even a 24 h water fast, during an already low carbohydrate diet, may not induce ketosis of this type. Milder ketosis states, with slightly elevated concentrations of ketones showing up in blood tests, can be achieved much more easily. In conclusion, the notion that ketosis causes accelerated aging to the same extent as chronic hyperglycemia seems more like fiction than fact. De Grey, A. (2007). Ending aging: The rejuvenation breakthroughs that could reverse human aging in our lifetime. New York: NY: St. Martin’s Press. Ketosis, methylglyoxal, and accelerated aging: Fact or fiction? Ketosis is a state typically associated with very low carbohydrate diets, such as the Atkins diet. In this state, the liver produces ketones based on fat (body fat or dietary fat). Unlike fats, ketones are water soluble and used by many tissues (including brain tissues) as a source of energy. Unlike glucose and lipoprotein-bound fats (in VLDL, for example), unused ketones cannot be converted back to substances that can be stored by the body. Thus excess ketones are eliminated in the urine; leading to their detection by various tests, e.g., Ketostix tests. This elimination of unused ketones in the urine is one of the reasons why very low carbohydrate diets are believed to lead to enhanced body fat loss. From an evolutionary perspective, one could argue that a ketosis state that involves the elimination of ketones in the urine is an inefficient and unnatural emergency mechanism. For our Paleolithic ancestors, dying of starvation was a much bigger problem than dying of obesity complications. An interesting hypothesis has been around for quite some time about a possible negative effect of ketosis. It goes more or less like this. Ketosis leads to the production of an organic compound called methylglyoxal, which is believed to be a powerful agent of glycation (a misnomer; see note below). Glycation is a process whereby sugar molecules “stick” to protein or fat molecules, impairing their function. Glycation leads to the formation of advanced glycation endproducts (AGEs), which appear to be associated with a host of diseases, including diabetes, and to be implicated in accelerated aging (or “ageing”, with British spelling). In short: ketosis leads to the production of methylglyoxal, which leads to the formation of AGEs, which in turn cause diseases and accelerated aging. Note: Since glycation refers to “sugar” molecules sticking to protein and fats, its use in the context of methylglyoxal is arguably incorrect. Methylglyoxal is not a sugar, but an aldehyde. Is this notion that ketosis, through methylglyoxal, can cause accelerated aging fact or fiction? Sorry, but I need to consult with my guru before I post my answer. Few would argue against eating seafood several times a week, except in the case of seafood allergy. Shrimp is a very good option, especially if it is not farm raised. 100 g of shrimp will typically have 20 g of protein, and about 152 mg of cholesterol (this is good for your health). It will also have about 0.6 g of omega-3 fats, and 0.03 g of omega-6; an omega-3 to omega-6 ratio of about 20. - Add a small amount of olive oil and water to a frying pan. - Add 1 lb of wild-caught peeled gulf shrimp, cabbage, onion, and asparagus (or green beans, as in the photo). - Cook in low heat for 15 minutes. - Add spinach and cook in low heat for another 10 minutes. - Turn off heat, season to taste while mixing; I suggest using garlic powder, cumin powder, and parsley flakes. Peeled shrimp is usually farm raised, which does not have the same amount of omega-3, or the same ratio of omega-3 to omega-6, as wild-caught shrimp. This small “salad” gulf shrimp was an exception. Check the package. If it doesn’t explicitly say “wild”, you are better off buying wild-caught shrimp and peeling it yourself. Shrimp peelers are sold in most supermarkets; the one I use looks like a Velociraptor claw. This is one of those interesting studies where the authors start with some pre-conceived assumptions and end up concluding something else, some way toward the opposite of what they assumed. My final interpretation of the study results is a bit different though. It suggests that the results are actually the opposite of what the authors originally assumed. The authors of the study (Poppitt et al., 2008; full reference at the end of this post) start by stating that since “… dietary fat is associated with increased lipid storage, weight gain, and obesity …” it is important to study the effect of dietary fat intake on the blood levels of certain substances that are associated with lipid disorders, weight gain and obesity. In short, the authors start from the assumption that dietary fat is bad. By the way, this type of indictment of all fats is not very common these days. Usually saturated fat is the target. Since dietary fat is assumed to be bad for us, that justifies the authors’ goal of studying the effect of dietary fat on certain hormones associated with bad health, including the body fat-secreted hormones adiponectin and tumor necrosis factor-alpha. Low levels of serum adiponectin, and elevated levels of tumor necrosis factor-alpha, are associated with various health complications. In the study, a high-fat test meal with approximately 59 g of fat (71% of energy as fat) was given at breakfast on two occasions to 18 healthy and lean men. These men had, on average, 23 years of age, a 31-inch waist, and a body mass index of 22.9. In other words, they were young and fit. Two fatty meal variations were used, one with a lot more saturated fat than the other. Their ratio of saturated:unsaturated fatty acids was 71:29 for the high saturated fat meal, and 55:45 for the other. The table below provides a more detailed picture of the fat composition of the meals. The authors refer to these meals as instances of “acute intake of dietary lipid”. Lunch, snack and dinner meals were also served to the participants. Those meals were nearly fat-free, with 1 to 3 g of fat only; apparently to help the participants “recover” from the high fat meal. They included plenty of refined grains (e.g., pasta) and fruit juices. Way to go; give these folks refined carbohydrates and sugars galore to help them recover from the “damage” done by the high fat meal! Blood samples were collected at 0 (baseline), 1, 3, and 6 h for the measurement of various substances, including the body fat hormones adiponectin and tumor necrosis factor-alpha levels. The figure below shows the variation in adiponectin levels at several times after the meal. The black circles are for the high saturated fat group, and the white circles for the other group. Adiponectin levels do not really start at the same level for both groups, which makes the graph a bit unclear; to better interpret the graph it may be a good idea to simply ignore the first (white) circle at the zero mark on the vertical axis. Also, no hormone levels were negative, of course; the zero on the vertical axis represents a reference value. As we can see from the figure above, adiponectin levels go up for both groups after the fatty meal, and end up higher than they started for both groups; more for the high saturated fat than for the low saturated fat group. They are at very similar levels at the 24 h mark, but the levels at 24 h for the high saturated fat group appear to be a lot higher than they were right after the fatty meal. (The start point for the high saturated fat group being the first black circle from the left on the graph.) None of the differences are reported as significant. This is not surprising, given the small sample. The figure below shows the variation in tumor necrosis factor-alpha levels at several times after the meal. This is an even more interesting one, because it suggests a possible negative effect of the low fat meals. In terms of tumor necrosis factor-alpha levels, the figure above suggests that both groups end up higher than they started, by about the same amount, which is not very good. (With tumor necrosis factor-alpha, unlike adiponectin, the less you have the better - so to speak, the hormone has important functions.) Again, none of the differences, with the exception of one, are reported as significant. The exception is the tumor necrosis factor-alpha level at 6 h for the low saturated fat group, which is significantly lower. But that difference disappears at the 10 h mark, never to be seen again. Interestingly, note that tumor necrosis factor-alpha levels go up very clearly after the additional meals, which were low fat meals rich in refined carbohydrate and sugars. The variation in adiponectin is not as clearly associated with the additional meals. The points at which those meals were served are indicated by the arrows at the top of the graph; first arrow from left for lunch, second for a snack, and third arrow for dinner. - There is some evidence that dietary saturated fat intake leads to increased levels of circulating adiponectin and decreased levels of tumor necrosis factor-alpha in the first few hours after a meal rich in saturated fat; with plenty of palmitic acid in it, by the way, of which animal fat is a great source. These are desirable and health-promoting hormonal responses. - These is some evidence that meals high in refined carbohydrates and sugars increase levels of circulating tumor necrosis factor-alpha in the hours following the meals. Elevated levels of tumor necrosis factor-alpha are not good news; something that I guess is implied by the name of the hormone. - There is some evidence that dietary saturated fat intake leads to an increase in adiponectin levels 24 h after a high fat meal, even when it is followed by low fat meals high in refined carbohydrates and sugars. This suggests a protective effect, which is in line with the hypothesis that adiponectin is not only a health marker by also a health-promoting hormone. Due to the small sample used, none of the conclusions above is based on statistically significant results. More research is needed in the future, with larger samples. I am not sure it will happen though. This study’s findings were obviously accidental, and saturated fat phobia is still widespread. Adiponectin is highly correlated with body weight, particularly weight associated with body fat mass. So, if you were able to achieve weight loss through a low carbohydrate diet involving a high consumption of saturated fat, there is absolutely no need to change that based on the results of this study. Plus, saturated fat has the added benefit that it increases HDL cholesterol, the “good” cholesterol. Humans, like many animals, evolved to be episodic eaters and spend most of their time fasting. Body fat is the main store of energy in the human body. Excess dietary carbohydrates and fat are stored as body fat, in specialized cells known as adipocytes. Excess dietary protein is not normally stored as body fat. Adipocytes can be seen as being part of a very important and distributed endocrine organ, being responsible for the release of many different hormones into the bloodstream. One of these hormones is adiponectin. Other important hormones secreted by body fat tissue are leptin and tumor necrosis factor-alpha. Among hormones, adiponectin is particularly interesting because it is negatively correlated with body fat mass. That is, unlike other hormones such as leptin and tumor necrosis factor-alpha, a decrease in body fat mass (a well known health marker) is associated with an increase in adiponectin. This has led some researchers to speculate that adiponectin is a causative factor that promotes health, in addition to being a health marker. Jung and colleagues (2008; full reference at the end of this post) studied 78 obese individuals (41 females) who participated in an exercise program during 12 weeks. The exercise program involved mostly low intensity aerobic activities, such as brisk walking. The individuals also took an appetite suppressant, with the goal of reducing their calorie intake by about 500 kcal per day. The table below (click on it to enlarge) shows various measurements for the participants before and after the 12-week intervention. From the table above we can say that there were significant reductions in weight, body mass index (BMI), waist and hip circumference, waist-to-hip ratio (WHR), total body fat, and total fasting cholesterol and triglycerides. However, the participants were still obese at the end of the intervention, with an average body fat percentage of 35.5. The table below shows the concentrations of various hormones secreted by body fat tissue, as well as other types of tissue, before and after the 12-week intervention. These hormones are all believed to be health indicators and/or health causes. We see from the table above that the hormonal changes were all significant (all at the P < .001 level except one, at the P < .05 level), and all indicative of health improvements. The serum concentrations of all hormones decreased, with two exceptions – adiponectin and interleukin-10, which increased. Interleukin-10 is an anti-inflammatory hormone produced by white blood cells. The most significant increase of the two was by far in adiponectin (P = .001, versus P = .041 for interleukin-10). One of the most promising effects of adiponectin seems to be an increase in insulin sensitivity. This effect appears to be unrelated to any effects on insulin secretion. That is, adiponectin seems to act directly on various cells, including muscle cells, increasing their ability to clear glucose from the blood. This effect seems to be one of the underlying, and previously unknown, reasons why loss of body fat improves health in those who suffer from diabetes type 2. Increased serum adiponectin has been found to be significantly associated with: decreased body fat and particularly visceral fat, decreased risk of developing diabetes type 2, decreased blood pressure, and decreased fasting triglycerides. Adiponectin appears to also have anti-inflammatory and athero-protective properties. On average, women have higher levels of serum adiponectin than men. According to Giannessi and colleagues (2007) administration of adiponectin in mice has shown positive results. Since research on adiponectin is new, it will probably be some time until related drugs are developed. Giannessi and colleagues also note that fish oil and vanadium salts may increase the synthesis and release of adiponectin. So far it seems that the most effective way of increasing adiponectin levels is weight loss, particularly through body fat loss. Even as new drugs are developed, this will likely remain the most natural and safe way of increasing adiponectin levels. All of this helps in the identification of missing links between body fat loss and health improvement. It seems that losing body fat has an effect similar to that of supplementation; it increases the blood concentration of a health-promoting substance - adiponectin! Giannessi, D., Maltinti, M., & Del Ry, S. (2007). Adiponectin circulating levels: A new emerging biomarker of cardiovascular risk. Pharmacological Research, 56(6), 459-467. Gil-Campos, M., Cañete, R., & Gil, A. (2004). Adiponectin, the missing link in insulin resistance and obesity. Clinical Nutrition, 23(5), 963-974. Jung, S.H. et al. (2008). Effect of weight loss on some serum cytokines in human obesity: increase in IL-10 after weight loss. The Journal of Nutritional Biochemistry, 19(6), 371-375.